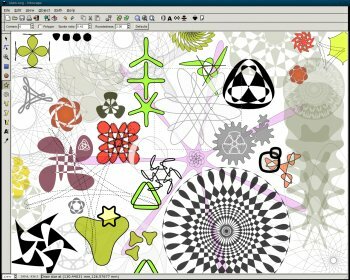 Inkscape is an open source SVG editor with capabilities similar to Illustrator, CorelDraw, Visio, etc. Supported SVG features include basic shapes, paths, text, alpha blending, transforms, gradients, node editing, svg-to-png export, grouping, and more. Its main motivation is to provide the Open Source community with a fully XML, SVG, and CSS2 compliant SVG drawing tool. EMF export does not work correctly for some line objects in Word 2010. This is not a bad app - and it IS free, which is great. BUT, it is a bit confusing and non-intuitive compared to some other apps. Serif has this Free version of DrawPlus that you can download and that works with SVG also, and even though it lacks some higher-end stuff like color separation and snap to vertexes and it does have a nag screen each time you exit, it has some really strong features and a really good interface with helpful hints, tips and features that I think will serve some folks better. I think folks should try that, because it really is pretty great for a free program. Imports and Exports and Edits SVG no sweat, including with an InkScape compatibility mode. 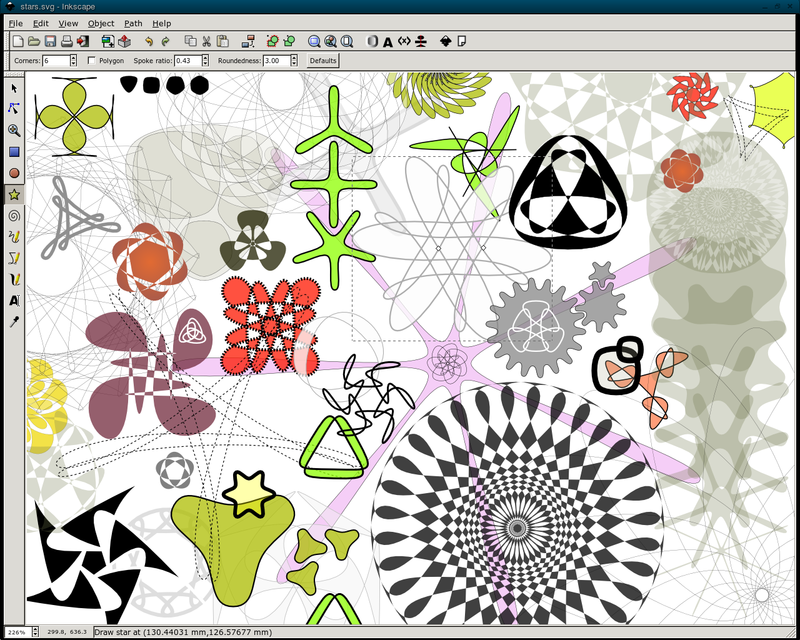 So while InkScape is cool, it's just not as mature as some other free options. Nice effort, and I hope they keep it up, cause SVG needs all the helpful, compatible support it can get so it becomes a really useful option. Vector graphic conversion inconsistencies are a real, real pain, but using InkScape and making drawings compatible with InkScape output might help SVG become worth using over bitmap. This is getting quite unbelievably good. It doesn't quite have the polish of Illustrator but the actual functionality and the way it's designed is in many ways better IMHO. AND it runs in any of the major operating systems. AND it's free! Gezley: Go ahead and flag the review. The opinion still stands regardless. Oh, and BTW, I'm not "white". I think foreigners' software is fantastic (which is why I've beta-tested dozens of programs over the years written by Europeans such as RAR and MyDefrag). Grab a tissue and read the review for what it is rather than inventing something it isn't. Second Shadow: OMFG. *8-) Thanks for helping with traffic to my site! Once again, the opinion stands. This program is a bloated pile of convoluted rubbish - way too many cooks spoiled the broth - I'll bet they could save several megabytes off the install by simply removing the 'about screen' code. But thanks for ending your "masturbatory response" (this descriptive phrase is courtesy of gcaleval) with a review of the program itself, at least. You should teach Mr Caleval that technique - go check out the Notepad++ review thread for details. Yes, that's probably what Dean-Ryan Stone (a.k.a. "dhry") meant when he wrote that. After all, everyone just *knows* that a program written by a John Smith is much better than a program written by some poor guy by the name of Sanjiv Sindhu (or something like that, I can't be bothered with spelling non-English names), right? RIGHT? However, I've yet to find a post by dhry written in a language other than English. I wonder if he's monolingual. It says "with capabilities similar to Illustrator, CorelDraw, Visio, etc." Yeah right, in your dreams maybe. The last chuckle I got was from the "about" screen, where the list of software authors is not only twice as long as that in Photoshop's startup dialog, but only about three of the names don't risk your tongue turning into a pretzel if you were to attempt to pronounce them. Is it that you have some sort of problem with software developers who don't have a White Anglo-Saxon Protestant [WASP] surname? Do you think foreigners write inferior software? Unless you provide an adequate answer to these questions I shall be asking Fileforum to consider withdrawing this review of yours as a veiled racist attack on the software developers. And no, I'm not some politically-correct loon. Just someone who takes issue with people who aren't brave enough to state their prejudices in plain English. Just as good as Illustrator, in fact some tools even in Inkscape are more innovative and friendlier to use than illustrator. If the guys working on Inkscape could start working on Gimp, we'd soon have a photoshop replacement on our hands too. 4 second startup (cold) on my Core2Duo e8500 4G WIndows 7 64-bit. The process uses 65M without anything open, and after laoding a few png's, it took close to 100M. When I loaded Paint.net it took about 60M with the same pictures loaded. All of these apps are rated A in my book for their intended purposes, all are free. Dragging toolbars had no strange/unintended effects. I haven't used inkscape in a while, but my it's come a long way. Extracted, this thing is well over 100Mb and takes about 10 seconds to start up on a core2duo with 2Gb RAM. The interface is painful - try dragging a toolbar to the end of another toolbar and it completely occludes it instead of properly relocating the toolbar. The settings dialog window doesn't persist its location either. Apart from that, seems to work well, but it just reeks of bad coding. Eating 114Mb of RAM immediately after starting up is pretty far from acceptable. The last chuckle I got was from the "about" screen, where the list of software authors is not only twice as long as that in Photoshop's startup dialog, but only about three of the names don't risk your tongue turning into a pretzel if you were to attempt to pronounce them. Phenominal set of powerful tools for a free open source app. Much of the features Illustrator has from Adobe, same end result, in a MUCH cheaper price tag. Excellent software.